He’s proof that age need not rob you of your deepest passions. 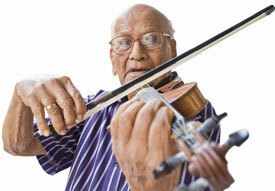 A professional musician for the past 84 years, Mumbai-ba sed centenarian Joe Menezes still offers music lessons. Born in Goa on 4 October 1909, Jose Matias Francisco Menezes – Joe, to friends – greets visitors with a firm handshake. Not surprising for a man who started using the walking stick only after his 100th birthday two months ago. “I give credit to my bicycle that I rode daily all over Delhi and Mumbai,” says Menezes. Though cycling helped him stay physically fit, much of his emotional well-being can be attributed to his passion for music. A professional musician, Menezes still offers piano lessons at his house in Bandra, Mumbai. Menezes’s lifelong affair with music started when he was studying at Island School in Malar, Goa, where a Catholic missionary first noticed his sharp ear for deciphering musical sounds. Menezes learnt to play the violin at school, apart from the basics of reading and writing music. At 16, he received an offer to join a musical troupe that played in cinema halls in Malaysia and set sail on a 10-day voyage to Kuala Lumpur, from where he later travelled to Malacca and Seramban in the next five years. “While the movie was going on, our group of five violinists would sit below the screen and play the background music,” he recalls. During one of his visits to Goa, while playing the harmonium in the local church choir, he met a young lady, Retinha. The two fell in love. As Menezes lived in Peshawar, Retinha travelled alone from Goa to Peshawar in 1941 where the two got married without the support of their families. Their son Albert was born a year later and daughter Sophia, in 1948. Just before World War II, the family moved to Delhi where Menezes got a job as a music teacher at St. Columba’s High School, a stint that was anything but easy. “The boys were rowdy and the principal had offered me a year to train them to form an orchestra,” he reminisces. “That’s when I decided I would never teach boys again in the future if I had a choice.” Today he gives piano lessons to three students – all girls. Disobedient students apart, Menezes recalls the breathless pace of his initial years in Delhi. “I used to go to the school at 6 am, then play at a restaurant during the lunch session, go over to my students’ houses to give music lessons and then go back again to the restaurant to play at dinner.” His hectic schedule hardly left him with time to think, let alone rest. “I had no weekly holidays and commuted all over Delhi on my bicycle.” Life switched to a more sedate pace when he got a job at the government-run Ashoka Hotel in Delhi where he worked for 10 years. It was the most secure job he had ever known. He even received accommodation at the staff quarters at Diplomatic Enclave in the Teen Murti neighbourhood – where then prime minister Jawaharlal Nehru lived and Mahatma Gandhi often visited. In 1968, Menezes decided to move to Mumbai. “My wife was keen to settle in North India but the climate didn’t suit me,” he says. The couple bought a house in Bandra. A few days after moving into the city, he got an offer to play music for films. Menezes joined the Cine Musicians Association and worked with music composers such as Shankar Jaikishan, Laxmikant Pyarelal and R D Burman. On the side, he also gave private tuitions in violin and piano. He continued to play music for films till he turned 90, by when the hassles of commuting and the changing norms of the music industry began to get to him. “In my heyday, a large orchestra of 80-100 musicians was quite the rage,” says Menezes. “Eighty per cent of the musicians, though, were dummies who only pretended to play the instrument. After the recording session, musicians used to unwind with a drink, but I was always too busy to hang around.” He is glad he remained a teetotaller and feels his disciplined lifestyle has been an important contributor to his good health. After retiring, he decided to offer tuitions at home rather than going to his students’ houses. Though, over the years, he had mastered the harmonium, piano, saxophone and clarinet – all on his own – he gave up playing wind instruments a decade ago on the insistence of his family who felt he was too old to exert himself. “It was with a heavy heart that I gave away my prized saxophone and two violins to music enthusiasts.” Today, he can still play the violin flawlessly, but the fingers that once played Mozart don’t comply so easily now. “My fingers and shoulders hurt a little now,” he remarks. After giving up his violin, Menezes focused on the piano. His beloved wife passed away 10 years ago but his life is still filled with the laughter and conversations of four grandchildren and two great-grandchildren. His daughter lives nearby, in Khar, while his son, who has a house in Andheri, now lives with Menezes. “I wanted to dedicate my time to him, so I moved over to live with him,” says Albert, 67, who enjoys the long conversations they share about the good old days. For Menezes’s 100th birthday, Albert and his sister threw a party that was attended by 150 family members from all over the world. Hi, Im interested in taking piano lessons .could I get the contact information of Mr.Joe Menezes?? Wow, Mr. Menezes taught me violin for over 10 years, infact he taught my brother and sisters too. And I never knew all this about him. Sadly we stopped learning music in 83 and this is the first that we have heard about him. Thank you for this post. Its always a joy to read about such passion for Music. Unfortunately, Western Classical has been drowned out by modern pop and 'Indi-pop'! I loved reading this. Thanks Anjali. If he's a Menezes from Malar there's a good chance we may even be related. Everyone is related to everyone in those parts!